Over the past couple of years I did a series of videos on Traincontroller. They have been posted on several European Model Railway forums, but not here. I don't remember how come. Anyhow ... here they are now. 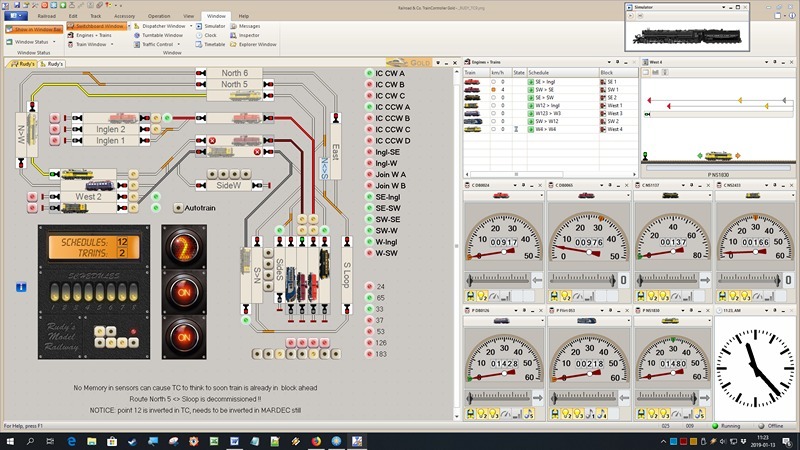 Traincontroller is model railway control software for Windows PC / laptop. There are a couple others like Koploper (free), iTrain, Windigipet, Rocrail (free) but when I tried TC I was immediately caught by how it works and how it looks. Once you made a drawing of your layout and added sensors on the track, TC can switch routes with full 'interlocking', meaning all points are switched, signs are set to red or green, other trains are halted. no collisions will take place. We can create routes from A to B, and we can create schedules that can succeed each other and we can even work with time tables. Trains can run fully automatic whereby TC takes care of realistic acceleration and deceleration and even with one sensor in a block TC can halt trains within one inch accuracy. Trains can also be manual controlled, where TC is the dispatcher and we are the operator and have to manoeuvre our train through the other (automated) traffic, adhering to red and green signs. The link below leads to the very first post. The quickest way to find the next one probably would be to type Traincontroller 02 in the search field. Also on the YouTube channel, to reach the first ones it's probably fastest to search for Traincontroller 01 (or any other number). Link to the Traincontroller series on my blog Rudysmodelrailway. Cool, looking forward to watching the series, would like to implement this on my railroad for animation. The onscreen programming is truly that simple. The hard part is wiring the hardware into the layout. If you're going to use the Digitrax BDL168 and SE8C for the block detection and signal control, I would recommend using the Accu-lits edge connectors to connect wires to the boards. They have the screw terminals instead of the soldering points that come with the Digitrax boards.